TOPEKA, Kan. (May 20, 2017) – A win at the NHRA Heartland Nationals is a one that will mean a little more than most to driver Tommy Johnson Jr. and his crew chief John Collins. Johnson and Collins grew up in Ottumwa, Iowa, about three hours from Topeka where the eighth NHRA Mello Yello Drag Racing Series event is being held at Heartland Park. It’s one of his home tracks. “It’s kind of like going home for me,” Johnson said. 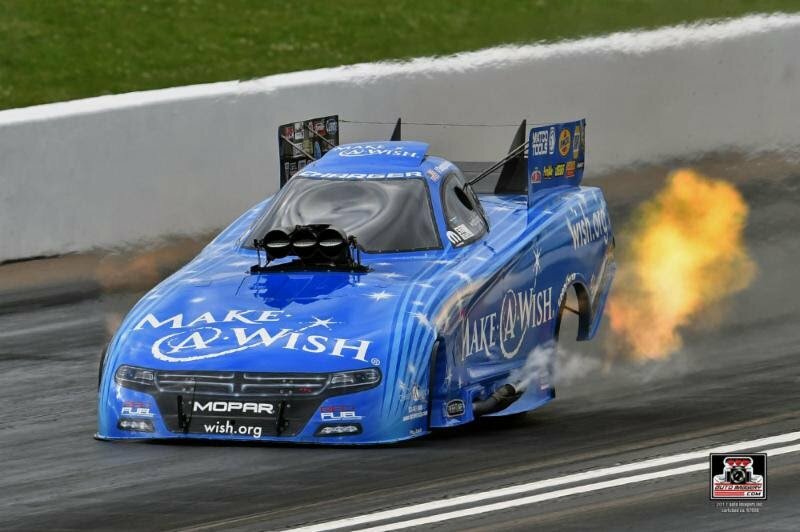 The driving forces for Terry Chandler’s Make-A-Wish 2017 Dodge Charger R/T Funny Car team will enter race day on Sunday as the No. 5 qualifier. Johnson qualified with a best time of 3.847 seconds at a career-best speed of 331.61 mph on his last run Saturday. On Friday, Johnson ran a lap of 3.990 seconds at 323.43 mph. Later, NHRA cancelled the second session because of storms in the Topeka area. “We didn’t run the big speeds or the low ETs like a couple of them did but we’re very close. We’re in the same zip code at least now. I feel good going into tomorrow. John and Rip (Reynolds, assistant crew chief) are liking what they see on the tune-up and they’re going the right direction every time.